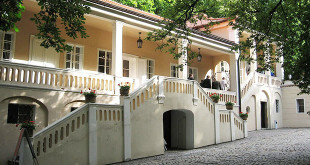 During the 18th century Villa Bertramka (today Mozart Museum) was the country home of the Dusek family. Wolfgang Amadeus Mozart stayed in this villa on his visits to Prague in 1787 and 1791. Here you can see the composer’s valuable manuscripts, his harpsichord and a lock of his hair. In the summer many concerts are held in the villa’s beautiful gardens. Open: 9.30am-6pm (in low season until 4pm); concerts usually start at 5pm.